Many years ago I listened to the audio book of City of Bones the eighth in the Harry Bosch series which I liked, but for some reason I never carried on with the series. However, when I saw the latest and twentieth Bosch book The Crossing on the library catalogue I was seized by the impulse to reserve it, and I'm very glad I did. Michael Connelly was arguably, Maxine's (Petrona) favourite crime writer and I really should have made the effort before to try another of his books. Over on the Petrona's Crime and Mystery Friends Facebook page I have floated the possibility of reading (some of) the earlier books in a read along/challenge sort of way and maybe posting the (monthly?) results on the Petrona Remembered blog. Does anyone fancy this idea or similar? As I'm knee-deep in Petrona Award submissions I would like to suggest making this a six months Spring to Autumn challenge leading up to the new book in November: The Wrong Side of Goodbye. 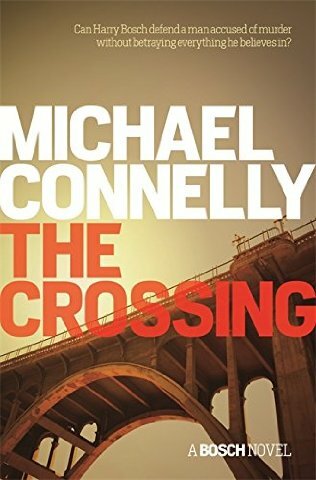 In brief, The Crossing finds Harry Bosch forcibly retired from LAPD and his half brother Mickey “Lincoln Lawyer” Haller asks for his help. He has a client who he is convinced is innocent but there is DNA evidence saying otherwise. Harry doesn't want to be one of those who make the crossing to the dark side ie defence but initially agrees to look at the official case notes. Of course he can't help himself and comes to think that maybe his brother has a point. 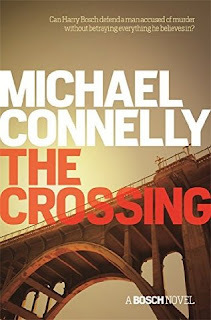 The crossing in the title has several meanings, not just going over to the dark side but also crossing a line and the crossing point for the victim and murderer. Though the case hasn't yet gone to court, Bosch's investigation is like a cold case investigation – which I believe was his previous job – with him going over the paperwork first and then making site visits and speaking to witnesses. I enjoyed The Crossing. It smacks of verisimilitude based on the author's experience as a crime reporter and it clips along, in a fairly spare style, as Bosch unravels the mystery. Bosch comes out better in it than Haller – who is in it much less - so it'll definitely be interesting to read one of the 'Lincoln Lawyer' series to see what Haller's really like. The Crossing was one of my favourite reads of 2015. Just read it myself, and thoroughly enjoyed it, as I have all the Bosch books. He deserves his place in the pantheon, and if you have not read the early ones, you are in for a treat.